Far from just a one-trick pony, Ben runs a historic venue and he is also an accomplished filmmaker with a number of interesting productions on a variety of topics. Ben Caldwell is a Southern Cali-based artistic legend. Check him out in his own words. M.O.I. JR: Can you talk about how you got into the arts? Ben Caldwell: My introduction to media arts came when I was a 4 years old and began assisting my grandfather, who was a projectionist at a small New Mexico movie theater. The popular film, “Cinema Paradiso,” is an Italian version of my young life. I used to change the reels or tell my grandfather when to change them. I saw hundreds of movies, and was an extremely film-literate young person. However, I never thought that film was a medium in which I would ever be involved. I thought it was far beyond me. My commitment to the visual arts started in the mid-1960s during the Vietnam War and continued into college, during the mid-‘70s. I earned my master of fine arts degree at the University of California at Los Angeles (UCLA) Film School. During the same period, I moved to the predominantly African American community of Leimert Park, which was at “ground zero” of the largest cultural uprising since the Civil War. My desire was to continue making films a viable part of the community. M.O.I. JR: What is the history behind the Kaos Network? 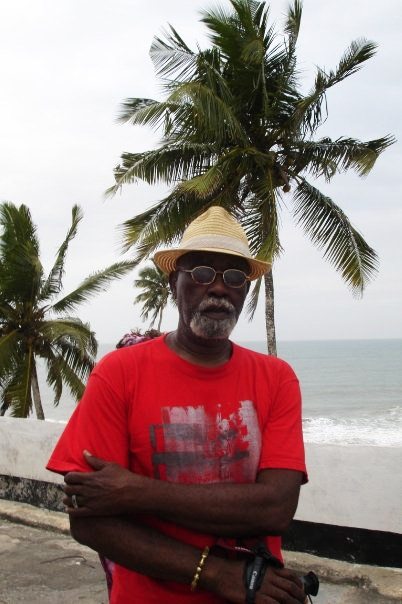 Ben Caldwell: I left Leimert Park briefly during the early 1980s to teach film and video production at Howard University. When I returned to LA in 1984, I started working with John Outerbridge at Watts Towers Community Arts Center and founded Video 3333/Kaos Network in Leimert Park. At that time, there were no independent video production or post-production facilities in South Central Los Angeles. My first contact with what was to be called the internet came when I worked with Kit Galloway and Sherri Rabinowitz at the Electronic Cafe in 1984. Electronic Cafe was a real time interactive social sites installation in five venues around Los Angeles, an installation hub at the Museum of Contemporary Art in downtown LA. The venue I managed was at a restaurant called the Gumbo House in Leimert Park. I was the project engineer at this site, Ulysses Jenkins was the project artist and my daughter Dara assisted us. That was the first opportunity that I had to see the possibilities in doing art with the cyber world. M.O.I. JR: What is its purpose? Ben Caldwell: Kaos is truly a family place. Another significant principle in developing the network was to empower the youth as well as adults of the community with the knowledge and understanding of the 21st century’s “cyber” technology. Families can participate in hands-on courses in video production and website development. Such a forum has provided access to technology previously outside the reach of most people. We are into giving the student artist a safe place to learn art and to work, create and produce. Not only do the youth reap the advantages of such a facility, but it also serves as a living resource for the entire Leimert Park community. M.O.I. JR: Who are some of the artists that have been there? Ben Caldwell: In 2006, notable Black and Latino hip hop artists of the famous South Central Los Angeles Hip Hop Project Blowed Collective, whose patrons include hip hop legends like Medusa, Aceyalone, Abstract Rude, 2mex, Riddler, Ice Cube, Snoop Dogg, Lenny Kravitz, The Pharcyde, Souls of Mischief, Mc Serch, Biz Markie, Fat Joe, Skee-Lo, Kurupt, John Singleton, Da Lenchmob, Eazy E from NWA, Bone Thugs n Harmony, DJ Uneek. Jurassic 5, Will.I.Am etc. M.O.I. JR: What are some of the events that are or have been based there? Ben Caldwell: Art class, Project Blowed, Kidz @ 43rd Place, Sesame Street-type children’s educational programs, rainbow music, lectures, merchandise – t-shirts, cd and dvd covers and miscellaneous – concerts, filming, animation class. M.O.I. JR: Can you talk about the movies that you have made? Ben Caldwell: “La Buena Vida (The Good Life): Hip Hop in Los Angeles and Havana”: It was shot over a span of three years; over 200 hours of footage was shot. This ambitious documentary project is about the musical and cultural exchanges of a group of talented young hip hop artists and musicians from Los Angeles and their counterparts in Havana, Cuba. This documentary celebrates the journey and outcome of one of the first such artistic encounters in the hip hop genre and is tribute to cross-cultural cooperation. I traveled to Havana under the “People to People” program, sponsored partly by California Institute of the Arts, to meet over 150 Cuban raperos and launch the first of a series of musical exchanges over three years, which would profoundly influence artists on both sides, giving birth to camaraderie, collective performances and a very well received album of extraordinary music. The documentary captures this exhilarating journey, mixing music with impressionistic glimpses of urban life in contemporary Cuba and never-before-seen performance footage and candid interviews from hip hop legends like Medusa, Aceyalone, Abstract Rude, 2mex, Riddler etc. on discussions over culture, music, artists’ struggles and women’s issues. The project is commercially viable in the music entertainment market as well as educational circles. Besides festival screenings, it is expected to generate considerable interest from Showtime, MTV Films, Discovery Channel, PBS stations, BET, National Geographic Channel, BBC etc. “Ancient Arts for Modern Living”: This documentary explores the lesser known connection between Africa and the ancient Egyptian and Indian yoga practices. Examining studies of scholars like Dr. Secundino Hernandez Cartio, Chuck Miller (Astanga yoga), Krishna Kaur (Kundalini yoga), Rama Jyoti Vernon (founder and publisher of Yoga Journal), Mary Paffard, Robin Downes (www.rechakayoga.com), Chris Hoskins, Puja Sue Flamm and Konda Mason etc. as well as oral traditions, myths and historical facts. The film investigates the connection between Yoruba beliefs, an African system of spirituality, ancient Egypt, the yogic chakra system and the Chinese concept of “chi.” This documentary is supported by the International Association of Black Yoga Teachers (IABYT), an organization dedicated to increasing the presence of yoga in the inner city and utilizing the art and science of yoga to better serve the African Diaspora and other communities around the world. The IABYT has more than 15,000 members, instructors and practitioners and conducts classes, workshops and festivals, spreading Kundalini Yoga as taught by Yogi Bhajan to underserved communities nationally and internationally – like the West African countries of Ghana and Togo. The documentary looks at the similarities in the culture, traditions, healing practices and spiritual concepts between the continent of Africa and the Indian subcontinent. For instance, Yoruba Orisha – spiritual forces – are found at points in the body that correspond to the chakras and nadis of the Yogic tradition and the meridians acupuncture points found in Chinese medicine. The film investigates studies that track the migration of Africans from Egypt and Ethiopia – ancient Kush and Nubia – to India and the founding of the Dravidian civilization that constituted the first high culture of India. By educating people about the African roots of yoga through this documentary, the IABYT is committed to sharing the art and science of yoga as the key to longevity and spiritual well-being among more children and adults, “at risk” youth, seniors, pregnant mothers, inmates and drug rehabilitation clients of color as part of their deep heritage. The film with its unique subject matter will be well received by film festivals, alternative health and fitness practitioners, academic circles as well as the general public – thus making it commercially viable to be widely distributed. “Eyewitness: Reflections of Malcolm X & the O.A.A.U: A Meeting With His Comrades 40 Years After His Murder”: On Aug. 29, 2006, in Harlem, New York City, 20 of the former members of El Hajj Malik el Shabazz’ – Malcolm X’ – Organization of Afro-American Unity (OAAU) met for the first time in 40 years and reflected on the significance of Malcolm’s last year of life. During that last year (1964 -1965), He made many international accomplishments, including starting two new organizations: Muslim Mosque Inc. and Organization of Afro-American Unity. This documentary captured that monumental meeting on Aug. 29, 2006, organized by Earl Grant, Peter Bailey in an effort to clarify the significance of El Hajj Malik el Shabazz’ last year with us. M.O.I. JR: Where do you see KAOS Network in five years? Ben Caldwell: Working on getting more involved with dramatic filmmaking that connects us with our journey like my first film “I&I,” which is a trilogy that tells a story of Alfie, an African goddess who engaged three American Blacks – one homeless, another at his father’s death bed, and lastly a young lady reflecting with her grandma about the power of the right to vote in their family. I also continue teaching and distributing the three documentaries. M.O.I. JR: How do people contact you? Ben Caldwell: Bencaldwellfilm@aol.com. The address is 4343 Leimert Blvd, Los Angeles CA 90008, (323) 296-5717.